The best travel is always when you can combine your passion with a new country and its culture. No matter what you care for, there will be others caring for the same things where you are headed. Find them! In September I took a group of 17 wonderful ladies to Beijing. The tour was a cooperation between KinaReiser and Trine Sandberg, Norway’s most popular food blogger, so you can probably guess the theme for the trip. 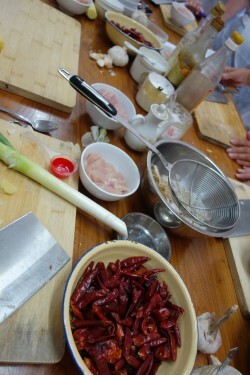 Cooking in Beijing! I certainly didn’t have a problem with that. Mostly because I love to eat, but also because it meant a slightly different itinerary. Less regular sightseeing, more of the real stuff. A bowl of noodles is the best Chinese comfort food, and to get them served fresh, outdoors on a beautiful autumn day with the Great Wall of China as a backdrop, that is pretty amazing. We stayed a night at The Schoolhouse at Mutianyu, and in the morning the cooking ladies showed us how this typical, Chinese dish is made. Incredible that just wheat flour, an egg, water and a pinch of salt can turn into meters of goodness. For fun you can add vegetable juice, like spinach or carrot, the colors turn out great. 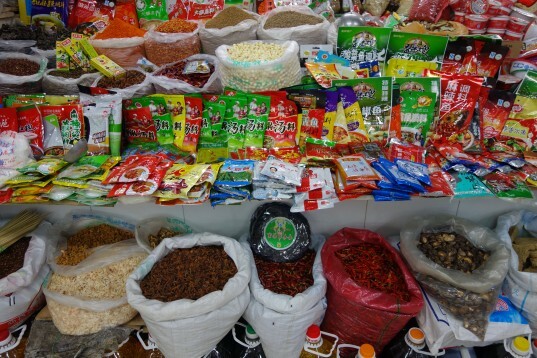 In a country that have survived on this staple for generations, the variety is huge of course. 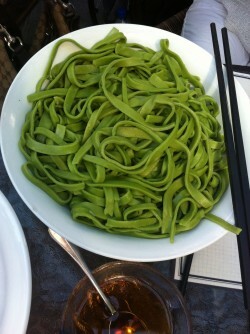 We watched them roll the dough flat, fold it and the cut it up in strips, making perfectly flat noodles. And then a little noodle magic; pulled noodles. The same dough with a little oil, and it can be stretched as long as your arms are! Then we ate the noodles straight from the boiling pot, mixed with an eggplant sauce, sesame oil, sesame seeds, soy sauce, pickled ginger, shredded cucumber, spring onions, tomatoes and cilantro. Oh joy! 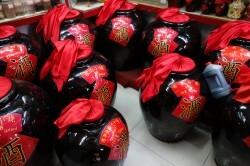 A proper Gongbao jiding needs lots of chili! Of course we had to do some hands on cooking, so we all piled into the spacious location of Hutong Cuisine inside the old residential area of Beijing. After an enlightened introduction to Chinese soya sauce, vinegar and cooking wine we each got our cleavers and chopping boards ready. Chinese cabbage, 5 cup duck and Gongbao jiding / Chicken with peanuts were on the menu. Cooking classes are so much fun. It gives you a welcomed break from all the passive sightseeing, where you take in one huge structure after the other. Here you are not only observing, but actively taking part in the culture. And in China, food is not only nutrition. It is history and medicine and food for your soul. Your hands get dirty, you learn a few tricks, you rub chili in your eyes by accident, you have a great time with your friends and in the end you get to eat your masterpiece. It was fun that we got to learn how to make Gongbao jiding, as it has somehow turned into a national dish of China, served to every visitor at least twice on their trip through the country. We also got the chance to compare the homemade version the various restaurant’s and you can guess which one was the best! If you ask me, the vegetable markets should be on every itinerary. For so many of us, grocery shopping means walking around a generic store where each pepper and cucumber are individually packed in plastic. Not so here! 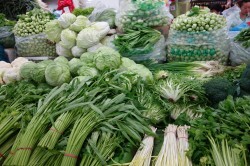 Visiting a Chinese vegetable market is almost senses overload. The fruit and greens are stacked high, the colors and shapes so beautiful and inspiring, I feel like going home to cook immediately. No more prefabricated food in my basket! The sellers eagerly hand out samples to taste and it is hard to resist all the wonderful fresh food. If it wasn’t for all the other stuff I always shop in Beijing, I could have filled my suitcase with pomelos alone. And it’s not only vegetables and fruit, but spices, noodles, sauces, tea and everything else you need to stock your kitchen. The meat and fish market might be a little bit too much for some, but it is part of the deal. Think about it, how often do you actually get to see all the parts of the animal? At least it is fresh! A common question is what do Chinese eat for breakfast? So we set out to do some research, with the help from the talented people at HIAS Gourmet. At one of Beijing most famous breakfast restaurants we tasted among other things vegetable spring rolls, sesame buns filled with pulled meat, very sweet ear shaped fried dough, fluffy deep-fried dough with sugar and different soups. I think the conclusion was that we are all happy with our regular breakfast, but at least we got an answer to our question. Outside the restaurant we tried two different bings, pancakes made fresh with a fried egg, spices and fresh spring onions sold by street vendors all over Beijing. Egg McMuffin should die of shame. While walking the narrow lanes of old Beijing with a hot bing in our hand we also passed a traditional liquor store selling baijiu. That is lethal stuff, I’m telling you. Or warning you. It does not taste good, not at 9 am or 9 pm, or even 2 am, when sometimes any alcoholic beverage can taste good. Not sure if my group finished their sample out of politeness or to kill any germs that could have sneaked in with the pancakes. I love the packaging it comes in, though, so beautiful. What else did we do? We ate, of course. An evening we went to the night marked, and while we passed on the scorpions and spiders and star fish, we did sample some of the more regular street food. We celebrated our last meal with crispy Beijing duck. And we can’t take people to Beijing for the first time without visiting the Forbidden City and spend a morning in Temple of Heaven to watch the locals exercise. And shopping. Can’t take 17 women to Beijing without spending time at the markets and malls, either. As usual I am amazed by how much you can do in four days. I will post more pictures from my trip on Facebook, please head over and have a look! 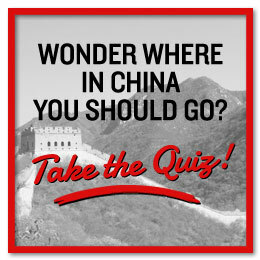 If you were going to Beijing, what would you love to include in your itinerary? Any hobbies or interests you would love to try in a different setting? You’ve peaked my interest to travel to China! I spend regular time in Bali and from your post, I’m inspired to experience more culinary adventure to like you said, learn more about the culture and history of Indonesia. This will also be relevant when visiting other Indonesian islands. Your life and passion are truly inspirational. Thank you for the beautiful illustrations of your recent Beijing journey. I almost feel like I went with you! Thanks Jocelyn! Would love to go to Bali, I can just picture all the fresh and wonderful food they must have there. Not Lucky Charms! I love this culture and appreciate you sharing it. People can be so similar and their cultures are so diverse. Thanks! Christine, what a delightful post! Sounds like you had tons of fun and the foods also sound delish! Thanks for sharing your experiences with us. I don’t know if I’ll ever get a chance to travel to Beijing, but if i do, I know just the person to reach out to give me the full scoop on what to eat! Christine – you had me laughing out loud at this “Egg McMuffin should die of shame.” 🙂 I would love to see the markets and just sit and watch people all day! I like to do whatever immerses me in the true culture. Out of the way restaurants (food is always a must), local crafts and artists, dance, and making friends with the locals. Feels like a real experience of the true culture. I’d love to check out a noodle demonstration and cooking class! Those both sound awesome to participate in (and knowing me, I can always use some cooking lessongs 😉 I’m also glad to hear that they only use a few simple ingredients to make the noodles – something I’d much prefer over the overly-processed noodles we find in most grocery stores. 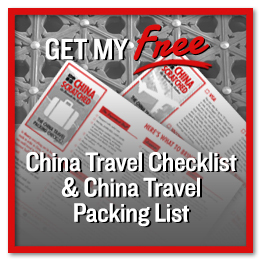 Wow, I’m about to slip into a hot bath and get ready for bed, but you’re tempting me to take one last peek in the fridge before I do – your adventures in China sound delightful! Thanks Christine for the inside view of your trip, written so I almost feel like I was right there along side you. The food and interactions with the people is always my favorite part of traveling although I do love the beautiful sites as well as long as they are not overly structured and it is more meandering in whatever direction I choose. Thanks for the view! Why haven’t we met yet? This is how live and travel. I haven’t been to Beijing yet but when I go I’ll be certain to connect with you, as I love insider places to eat. Looks and sounds delicious! I am Chinese and grew up eating this yummy food…just wish I learned how to cook it! I’m definitely going to have to take lessons from my mom. Noodles are the best! If your mom will consider taking more students, let us know! Thanks for sharing it, while reading I’ve almost bought a pasta maker on Amazon. It feels as if I’ve been there, very well written. Chinese breakfast seems very interesting, do they drink coffee? because Facebook is my thing I cannot notice how well you have combined your blog and Facebook, that your post invites to continue following your trip on Facebook, which I did and liked your page. Ha ha, a pasta maker would definitively be of help, the reason why I am not making my own noodles is all the work, although the taste and feeling of accomplishment is worth it! Chinese have just recently started drinking coffee, you can thank Starbucks for that. Most people drink warm soy milk for breakfast and then different teas throughout the day, depending on season and mood. 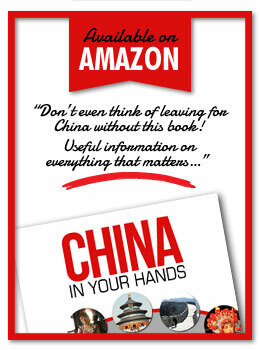 Thanks for your support, Inga, hope you like ChinaScratched on FB! What a wonderful picture you painted of your trip, and the food delights you encountered!! I am majorly into food and trying new things, and it sounds like you had quite a delicious time! For me, at any new place I visit, I love to try the local foods and specialties, so this trip is right up my alley! Thanks for sharing! YUM! I’m hungry! Your descriptions are delightful. And I now know what’s for breakfast in China…and I could certainly go for a ‘bing’ right now. I look forward to reading more of your experiences. Hi Bjørg, it was a great trip! Much thanks to you and the other great cooks!